Do you dream of walking the Camino de Santiago, but don't have enough time? No worries! It's possible to take in parts of the Camino during a city break getaway in Spain. You'll soon see that the perfect place to combine nature and the city is undoubtedly San Sebastián, in the green north. If you are going on holiday in the Basque Country, we would definitely recommend choosing to stay in a holiday rental in San Sebastián. This seaside city has three beautiful beaches, bustling pintxobars in the historical centre, and is home to architectural pearls of the Belle Epoque. 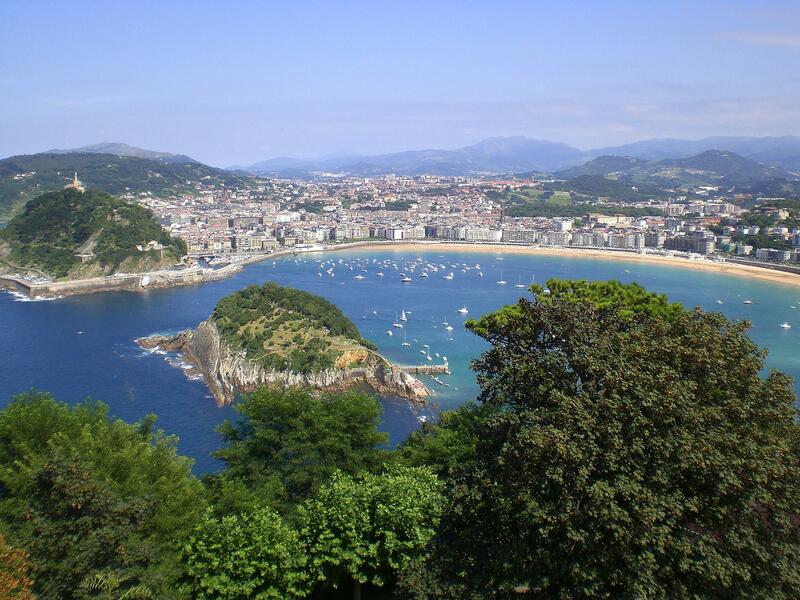 From San Sebastián you can also go on fantastic hiking excursions, surrounded by the sea and green mountains. These hikes are part of the Camino de Santiago and they offer not only impressive trails along the coast, but also lead to the most beautiful villages! You can reward yourself after your hike with delicious 'pintxos' (the famous Basque tapas) or an excellent meal of fish or meat. 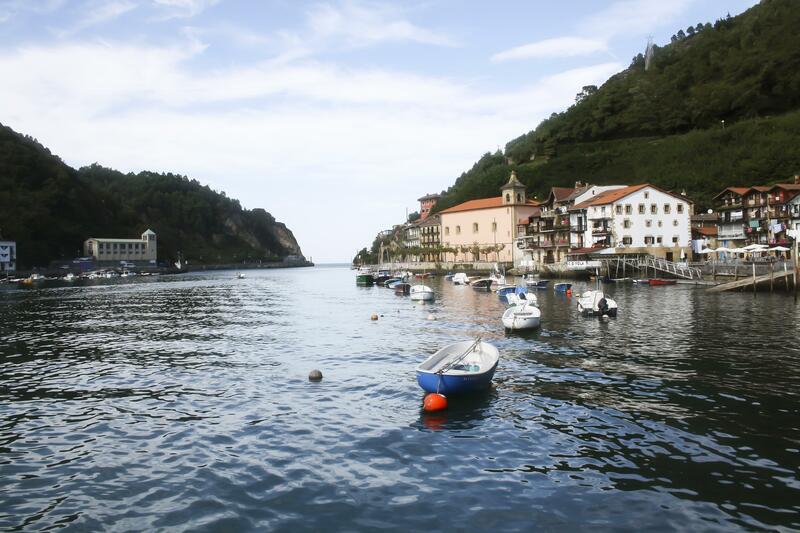 The Basque locals are in fact well known for their appreciation of food, as well as their love for outdoor sports. 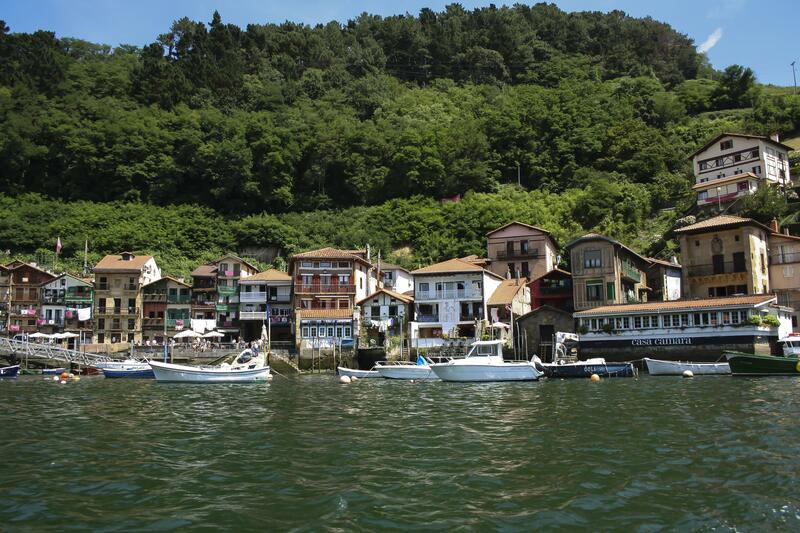 So, put on your walking shoes and do as the Basques do, we're taking you on fantastic itinerary! This walk leaves from San Sebastián itself and takes you to the neighbouring Pasajes de San Juan, a surprisingly charming fishing village. The walk goes along the sea on the Ulía mountain that borders the east side of the city, just after Zurriola beach. Upon arriving in Pasajes de San Juan, you'll be able to enjoy lunch and the truly picturesque area. 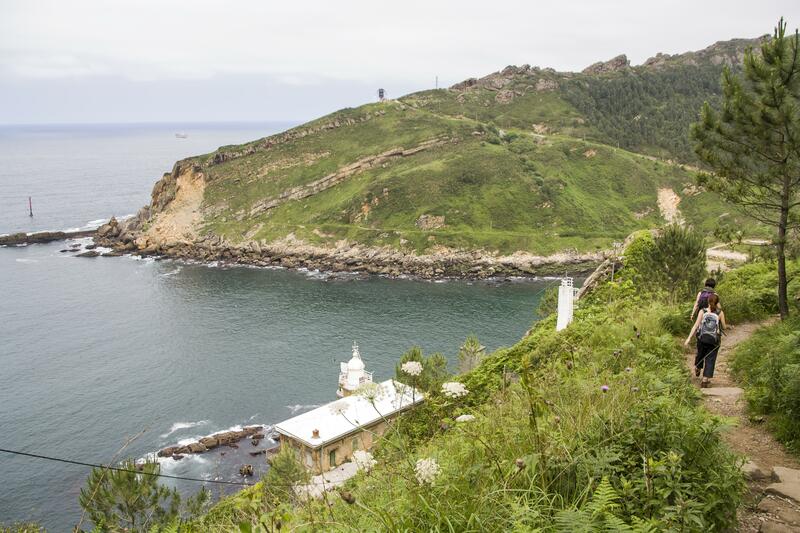 The San Sebastián to Pasajes de San Juan hike is a popular Sunday outing among locals. Camino pilgrims can be seen walking in the opposite direction (indicated by yellow arrows), but that is no problem - your walk the other way is equally beautiful and takes less than three hours. 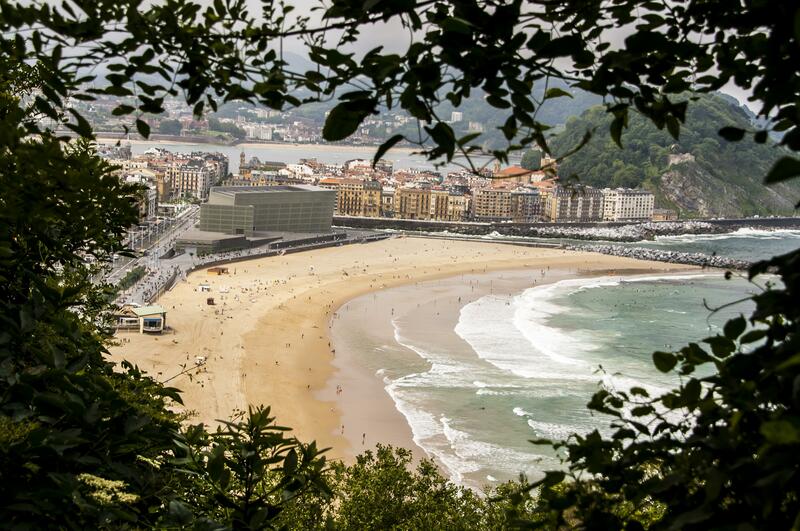 After your walk you can use public transport to get back to your holiday accommodation in San Sebastián. Where exactly does the walk begin? The starting point is easy to spot. It is right next to the pumping station at the beginning of Avenue Navarre (Navarra Hiribidea) and is directly accessible from the Zurriola surfing beach. Once at the petrol station, simply follow the sloping street on the left side. It soon turns into steps (and there are quite a few!) - definitely a good warm-up for the upcoming walk. From the top of the stairs, there are fantastic views of Zurriola beach and the town. But this is only the beginning, you still have a long way to continue to enjoy the beautiful sights. 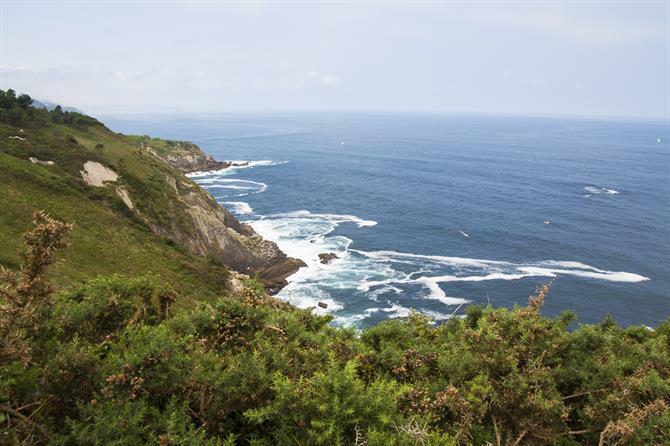 Firstly through the greenery, then overlooking the rugged coastline with the sea all around. A walk that is impossible to beat. Getting lost is near impossible, you just need to follow the path along the coast. There are also occasional signs that display the remaining distance to Pasajes de San Juan (Donibane in Basque). 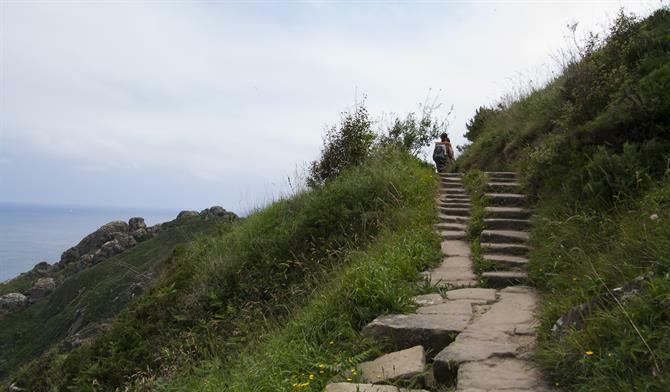 The end of the walk is particularly impressive; you descend alongside the Faro de la Plata (Silver Lighthouse), again using stairs, but this time downwards and right along the water. You will first arrive in the harbour village of Pasajes de San Pedro and across the water you will see the beautiful Pasajes de San Juan emerge next. The water between the two fishing villages flows into an inlet through which large boats arrive from sea at Puerto Pasajes, the harbour entry. An impressive sight! 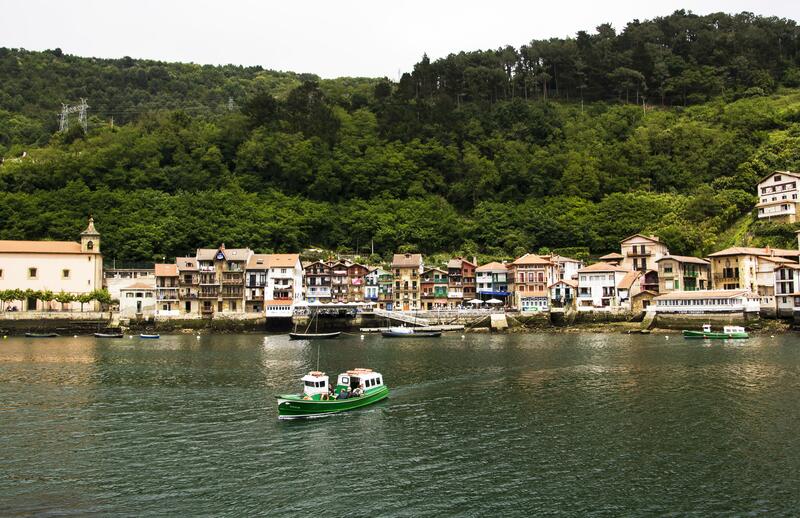 You can get from the village of San Pedro to Pasajes de San Juan yourself by taking a small green, red and white boat (the colours of the Basque flag). The crossing costs just a few euros and in a couple of minutes you'll be on the other side. This lovely boat trip will seem too short, so take full advantage of it and make sure to be looking around from the beginning. Once arrived you can choose from some excellent seafood restaurants. We recommend Casa Cámara and Ziaboga for the best fish and seafood. Ziaboga is located at Plaza de Santiago, a nice and cozy little square where you can enjoy the view from the waterfront terrace. You can take a bus back to San Sebastián every 20 minutes from Pasajes de San Juan (from 20:30 buses depart every half hour). On the map below you can see where exactly the bus stop is found (on the street Juan XXIII near the frontón or tennis wall). During both the week and on weekends the last bus departs at 22:40, so this definitely gives time for an evening meal in Pasajes! 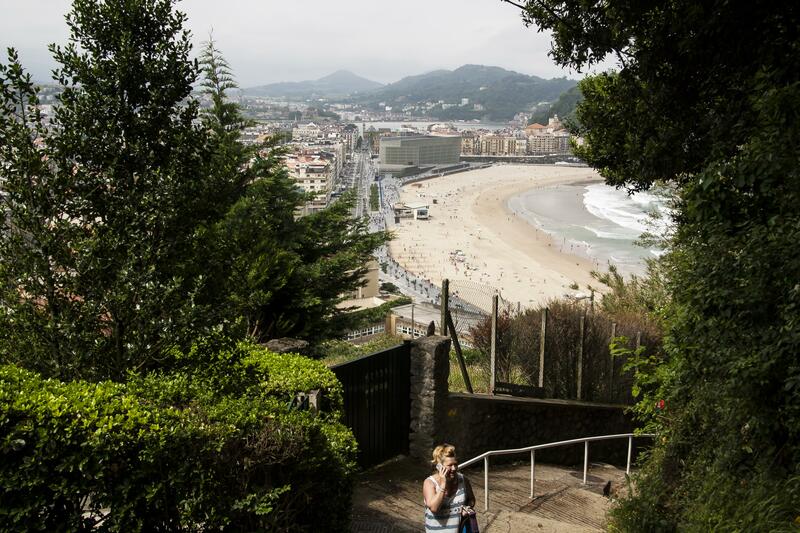 Check out the schedule and bus route from Pasajes de San Juan to San Sebastián. - A good pair of walking shoes is essential. It is a dirt trail with some rocks, boulders and sloping areas, so make sure that you have sturdy footwear that offers good support so that your walk will be a comfortable one. 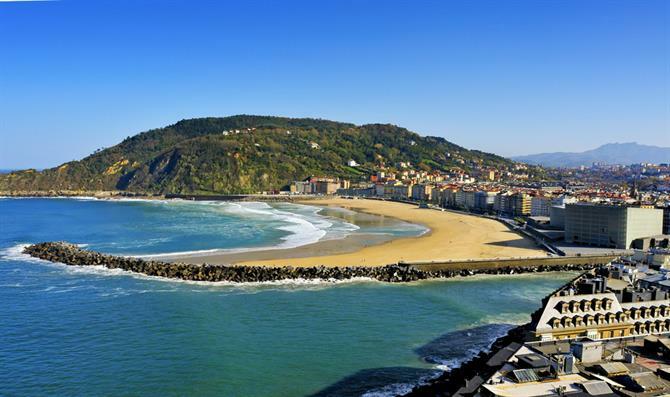 - The weather in San Sebastián can be very hit and miss. The sun might be shining when you go out, but clouds can emerge just as quickly and even rain is possible. The same goes for if it is cloudy, make sure to protect yourself from the sun, especially in the summertime. Bringing a light and easy to carry raincoat or windbreaker is always a good idea. In any case, check the weather forecast beforehand. - There are no facilities along the trail to Pasajes - it truly is a nature walk! Bring plenty of water and possibly some snacks. Bringing a picnic is also a nice idea because there are many breathtaking views. You can pick yourself a spot on a rock along the way or wait until you arrive at a picnic table about halfway through your walk. 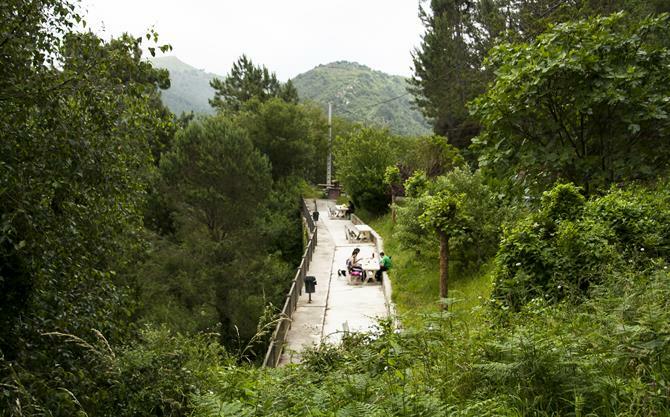 There are several picnic tables surrounded by lush nature near Pasajes de San Pedro. Try to keep at least some of your appetite to sample the local cuisine in Pasajes de San Juan and enjoy a drink on a terrace! Interested in learning more about the entire Camino? Read our article that takes you along the Camino de Santiago.